In addition to our Truckload direct coverage area, ECM TRANSPORT provides Truckload service to the contingent 48 states and Canada. Responsibility is never shifted when using ECM TRANSPORT for the long haul. Our one-stop-shop approach provides a simple approach for our customers to handle all of their transportation needs with one phone call to ECM. Whether your needs call for Truckload, Less-than-Truckload, Rail, Expedited or Air, the relationships we’ve established with our transportation partners over the past 30 years guarantee you a seamless experience. 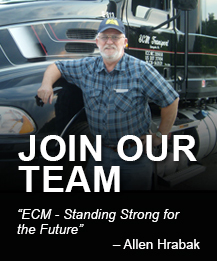 No matter where your transportation needs take you, ECM has the solution for you. To schedule your next Truckload shipment call 1-800-548-7379!